Note: Domain-level search is available when searching for annotations (not on the search bars on our public-facing website, which you’re viewing right now). Log in to Hypothesis if you want to try it out! Our domain-level search feature allows you to find all annotations across a domain (or part of a domain) with just one search. This feature is available through our API and at https://hypothes.is/search. A screenshot of our new domain-level search functionality. 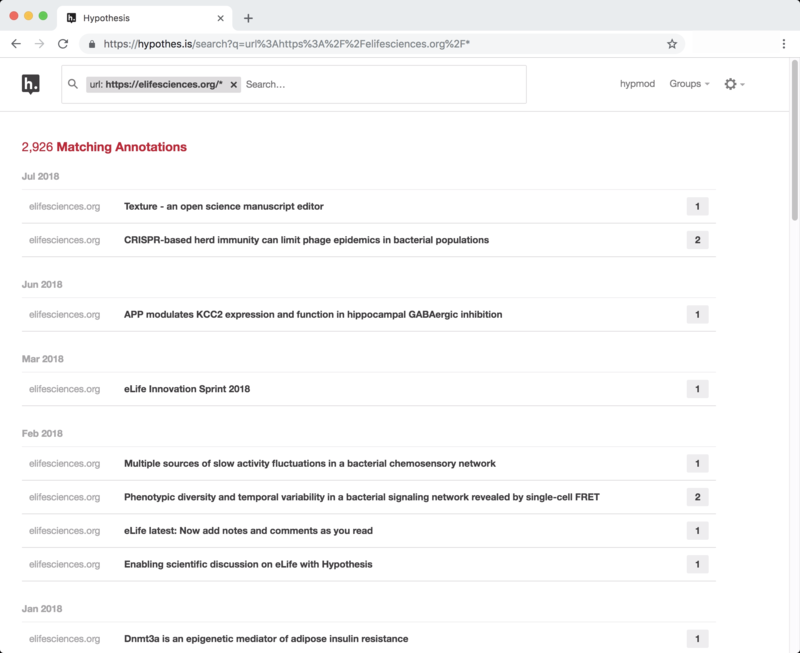 Searching “url: https://elifesciences.org/*” returns annotations across all of elifesciences.org, yielding 2,926 matching annotations at this time. Note that if no scheme is provided, HTTP/HTTPS will be assumed. For example, url:en.wikipedia.org/* will return all results for annotations at Wikipedia – there is no need to type out url:https://en.wikipedia.org/*. There are two important operators to know: * and _. * will match any character sequence (including an empty one). *s are not permitted in the protocol or domain. url:https://*lifesciences.org/* is not a valid search because it contains * in the domain. _ will match any single character. It will not return annotations on eLife URLs with more than 1 character after the final /. _s are not permitted in the protocol or domain. url:https://_lifesciences.org/* is not a valid search because it contains _ in the domain. Send us a support ticket to get more help.